For years I’ve been searching for a versatile travel garment that can be worn many ways and translated into casual and professional outfits. I thought I’d found it in the Patagonia Kamala skirt dress, but I preferred one look over the other. I tried again with the American Apparel Bandeau dress, but I could only wear a few dress styles for my body type. So when Brooke mentioned the Encircled Chrysalis Cardi as one of her picks for a great gift for the female traveler, I had to immediately look it up. Kristi, the designer behind the Chrysalis Cardi, was inspired by a yoga retreat in Costa Rica. Her love of both her circle scarf and cardigan led to the creation of the garment, made with eco-conscious fabrics and handmade in Canada. Caroline showing off the Chrysalis Cardi in 8 different ways! Please note: Caroline is about 5’6″ as an FYI. The Chrysalis Cardi can be worn in dozens of ways, but eight specific looks are showcased by Encircled. This includes a dress, a tunic, a scarf three ways, a cardigan, cape and halter. It folds down for easy packing, making it ideal for the fashionable traveler. It also keeps you from needing to bring quite as much. As with all multi-wear products, you may like one look over others and for me, the scarf and dress looks suit me best. I love the Grecian inspired dress for nights out as well as bundling up in the scarf to keep warm in winter. It’s also easy to accessorize and comes in a handful of colors. I found that I am more likely to wear this product as a dress and scarf instead of the cardigan, cape and halter, as it seemed to be too much draping for my frame. The Chrysalis Cardi look, pictured above in photo 1, is their signature style, but I found the one shoulder dress and tunic styles to be much more flattering. I even came up with a few of my own looks, like the longer tunic and one shouldered dress, as well as a head scarf for those days at religious sites! Is it difficult to figure out the different looks? The product may cost $138, but with 8 looks, your cost to wear once per month in six months is only $3. If you’re going to be traveling to a place where you’ll need to dress up but also be comfortable, the Chrysalis Cardi is great for you. Encircled also sells the Evolve Top, which is made of the same materials and can be styled into different necklines. I love my Encircled Chrysalis Cardi and am already planning to bring it on my next big trip! >> Head over to encircled to learn more, or check out our review of their Evolve Top or Dressy Sweatpants! It’s supposed to be super drapey and cozy for those chilly plane rides! I designed it with the purpose of being a beautiful travel piece that can be dressed up or dressed down very easily. I agree! Love, love the cardigan style a lot! This looks like a great idea! It looks like quite a soft fabric – did it feel nice and soft to wear? If you want to read more on the fabric (Modal blend), you can click here (http://www.encircled.ca/pages/modal). Modal is also eco-conscious as it’s derived from a renewable resource (Beechwood cellulose) and processed with no chemicals, and no toxic discharge into the environment. WOW!!! This is an incredible invention! Need to add it on my packing list!!! Hey all! Yes, fabric is so soft. It’s jersey stretch, so basically the best fabric ever for travel, as it doesn’t really wrinkle. Highly recommended! Keep us updated when you get your new Cardi 🙂 Just an FYI, I checked with Caroline and she is just about 5’6″. While being short will make the outfits a little longer, the tunic can be shortened. Best of luck! We have lots of more petit women wearing the cardi. I recommend using the belt (it comes with one made out of the same fabric) or your own belt when doing the cardi and cape looks. It will help cinch the fabric in to make it more fitted! The dress looks will be fabulous, just a bit longer! Tag us in some pictures when you try it on! Would this work for + sizes? 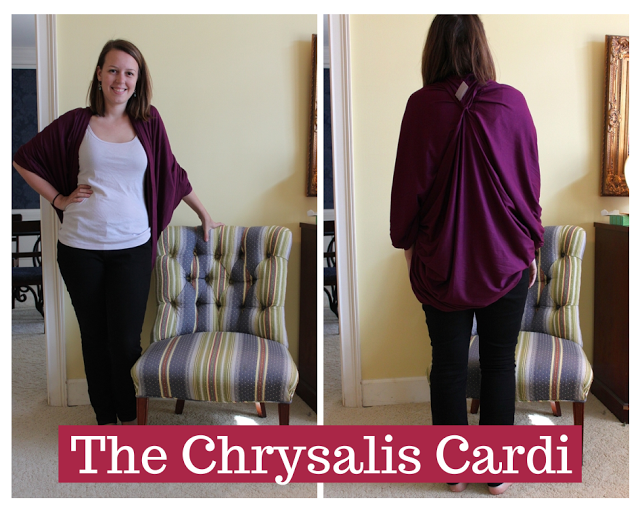 The Chrysalis Cardi is “one size fits most”…. I can tell you it generally suits size 2-16 however some looks will fit certain body types better. For example, the dress looks on someone 5’0” and under are more maxi-dress style. As the Cardi is made from a lot of fabric, it can be as drapey or fitted as needed. we’ll look forward to having you as a customer! What color is in the photos? Is it raspberry? The photos on the encircled site look much lighter. I just can’t decide between versatile black or a pop of color like raspberry! The colour in the photos is the Raspberry. On our website, it appears much lighter. It’s a lot darker (more like the photos here) in person. It’s a beautiful colour though that is versatile and easily worn all year ’round! THANKYOU for showing this on a real person. Everything looks fabulous on a gorgeous 6ft stick. You look great btw, just more like the rest of us! I love your grecian dress, and am much more likely to purchase having seen it on someone who looks more like me. Plus some plus size models wearing them on their website wouldn’t hurt either. We love showcasing our designs on real womens bodies… because our customers are REAL people, and that is exactly who we design for. I’m actually our fit model, and I have curves! We are looking to shoot a size guide for our Chrysalis Cardi this fall which will show the garment on a variety of sizes + shapes of women. Stay tuned for that. Appreciate your positivity! I am very interested in this chrysalis cardi, as seen on Her Packing List. It is a big investment for me, plus postage to Australia! Thanks for your comment! We do have plus sized customers wearing our Cardi, generally we’ve found up to size 14-16 works for most of the looks. Please send us a note at contact(at)encircled.ca and I can connect you with a few of our customers who can share their sizing experiences! I am thinking of purchasing the chrsalyis cardi for my upcoming trip. Does anyone have know of a new discount code? thanks! I liked the idea behind the infinity dress, but not so how much how it ends up looking when you wear it and tie it etc so this piece looks fantastic! I was just wondering, how warm is it when worn as a cardy? Enough for proper cold nights or just for slightly cool afternoons? Or in hotter weather, does it keep you cool and covered or sticky and sweaty? Not sure if that will make any sense to anyone but if anyone could enlighten me, it would be gretly appreciated! Thanks for your interest in our Chrysalis Cardi! Our Cardi does offer a nice layering piece for cooler evenings etc, but it wouldn’t replace an item such as a sweater/jacket. I actually find that it’s warmer when worn as a cape as it offers more coverage for cooler nights. Our Cardi does well in warm weather as Modal is quick breathable. I wouldn’t however recommend it for somewhere really hot (ie, India) though as you may find the fabric too heavy. Feel free to read some reviews on our website! There is lots of helpful information to access there.